From the beginning the theatrical current conflict over expanding health coverage to include most Americans has had more than its share of absurdities. The centerpiece of the legislation, the so-called “individual mandate” comes from 1990s Republican proposals for health insurance reform and was a key component of Massachusetts Governor Mitt Romney’s signature achievement in office. On the other hand, candidate Barack Obama, campaigning against Hilary Clinton in 2008, opposed the idea. Fast forward a few years, and the argument is being replayed, but this time with President Obama supporting the so-called “individual mandate” and Romney and the Republicans opposing it. This may be good political theater, but little else. There never really was a serious constitutional issue to be resolved, just a political conflict to be adjudicated in constitutional disguise – another example of our American addiction, long ago noted by De Tocqueville, to try to resolve political issues judicially. The great favor the Supreme Court has done for the country in this case is to acknowledge that it is for the political process and elected politicians – legislators and executives – to address and try to resolve pressing problems. American healthcare – a leviathan which incentivizes extravagant and wasteful expenditure, while leaving millions without adequate health care at all – is clearly such a pressing problem. The ongoing conflict over whether to continue moving forward in addressing this problem is now returned to the political process – the place it always belonged. Meanwhile, the Court – which is to say the Chief Justice, the star player in the decision and (apart from the millions who will now be assured of healthcare) perhaps the biggest single political winner – has reshaped our constitutional landscape in directions both promising and perilous. Promising is the Chief Justice’s choice in favor of judicial restraint – revealed in his invocation of the principle (Hooper v. California) that “every reasonable construction must be resorted to in order to save a statute from unconstitutionality. Since at least the 1960s, it has become common for advocates of radical ideas – of either the left (e.g., overturning abortion and marriage laws) or the right (e.g., opposing campaing finance reforms and the Affordable Care Act) – to turn to the judiciary to try to produce results not so readily achievable through the political process. The harm this has done to democratic governance has been immeasurable. And it has been one of the single most significant contributors to the total polarization of our society. It would be utopian to expect that this is going to stop any time soon. But certainly the Chief Justice’s decision in this critical case not to let the Court be used in a partisan manner to undo the democratic process of legislation is a welcome development. The Court also imposed restraint upon Congress. The power to regulate interstate commerce is not to be interpreted as infinitely malleable and expansive. How perilous that may turn out to be, whether that will unduly burden the government’s ability to address national needs, remains yet to be seen. The unexpected Medicaid part of the decision also seems to me counter-intuitive. Medicaid is, after all, a federal program which gives states money to which they are not automatically otherwise entitled. Federalism is problematic enough without further empowering states to be obstructionist. All that said, however, the Chief Justice’s forcible imposition of restraint upon his Court it seems to me, has thrown democratic governance a welcome lifesaver. And that is no small matter. The US Supreme Court this morning issued what was perhaps the most awaited decision in over a decade, and the result was a surprisingly good call on both policy and legal grounds. Most importantly, the Court has upheld the so-called "indiviudal mandate" provision of the Affordable Care Act. I haven't read the complete Opinion, of course, but I did read the Court's 6-page Headnote (what SCOTUS likes to call a "Syllabus"). With what seems to me to be admirable legal dexterity, the Chief Justice found that Congress in the ACA had described the penalty for not purchasing indurance as precisely that - a penalty - rather than a tax. Hence, the Anti-Injunction Act (which requires payment of a tax prior to any suit challenging its constitutionality) does not apply in this case. On the other hand, according to the Chief Justice's opinion, Congress's not calling it a tax "cannot control whether the payment is a tax for purposes of the Constitution." This allowed the Chief Justice to argue that, while the Commerce Clause cannot be construed to permit regulating what individuals do not do and that therefore the "indiviudal mandate" cannot be sustained as an exercise of Congress's power to regulate commerce, it is constitutional as an exercise of Congress's taxing power. Personally, I am not one of those worried about absurd hypotheticals - like being compelled to purchase broccoli. But this seems like a good solution - simultaneously saving the madate while avoiding a possibly problematic expansion of federal power. (Since there is no doubt that Congress can levy a tax, a tax is precisley what the Court has decided to call it). The Court did weaken somewhat the Medicaid expansion part of the Affordable Care Act, by overturning not the actual expansion in Medicaid coverage but the penalty levied on states which choose not to participate. So some state governments for ideological reasons may avail themselves of this loophole in order thus to deny many of their poorer citizens the benefits of the law. That would be unfortunate. Sooner or later, this country must find a way to protect everyone from the inability to access needed health care. But, with the precedent now set that there are constitutional ways to do this, sooner or later that goal should be attained. The Court's judgment is a great victory for the long-cherished goal of expanding Americans' access to health care coverage. The United States Catholic Bishops, for example, have supported decent health care for all and advocated action to advance that goal since 1919. As has become evident recently, there remain serious unresolved problems with ACA's lack of guaranteed protection for religious communities to exercise religious freedom. A lawsuit challenging the HHSD contraception madate has already been filed, which will likely make it to the Supreme Court in due time. All that said, the Court - in particular, the Chief Justice - seems to have crafted a very satisfactory solution. To commemorate the 50th anniversary of the opening of the Second Vatican Council on October 11, 1962, and also the 20th anniversary of the publication of the Catechism of the Catholic Church, Pope Benedict XVI has invited the Church to observe a special “Year of Faith” from October 11, 2012, to November 24, 2013. The image for this year is the “door of faith,” the title of the Apostolic Letter Porta Fidei, in which the Pope announced the “Year of Faith.” The image is based on Acts 14:27, where Paul and Barnabas “called the church together and reported what God had done with them and how he had opened the door of faith to the Gentiles.” This “door of faith,” Pope Benedict writes “is always open for us, ushering us into the life of communion with God and offering entry into his Church. It is possible to cross that threshold when the word of God is proclaimed and the heart allows itself to be shaped by transforming grace. To enter through that door is to set out on a journey that last a lifetime” (Porta Fidei, 1). This will not be the first time a Pope has proclaimed a “Year of Faith.” Pope Paul VI did so in 1967 to commemorate the 19th centenary of the martyrdom of the Apostles Peter and Paul. Pope Paul saw it as an opportunity for the entire Church to make “an authentic and since profession of the same faith,” in a way that was “individual and collective, free and conscious, inward and outward, humble and frank” (Petrum et Paulum Apostolos, 196-198). Even a stopped clock, so the familiar saying goes, is right twice a day. So too, for all its faults and elitist arrogance, even the U.S. Supreme Court can get it right (or at least almost right) on occasion. One such occasion came yesterday, when SCOTUS struck down much of Arizona’s infamous anti-immigrant law by a 6-3 vote. The Court’s majority agreed with the United States in regard to three of the provisions of the law – provisions making it a state crime for undocumented immigrants to be in Arizona or to seek work there and a provision authorizing police to arrest anyone suspected of being deportable. The Court agreed with the United States’ argument that the Federal Government is responsible for regulating immigration, and that states may not undermine federal legislation with their own competing laws. The Court let stand another provision of the law – the provision that requires anyone suspected of being in the U.S. illegally to produce immigration papers and requires police to check a suspect’s immigration status before releasing him/her. That provision can now go into effect, with the warning that today’s Opinion “does not foreclose other preemption and constitutional challenges to the law as interpreted and applied after it goes into effect." The U.S. Conference of Catholic Bishops had filed a Friend of the Court brief in this case. Speaking yesterday on behalf of the USCCB, Archbishop Gomez of Los Angeles expressed concern about the potentially harmful impact that that the one remaining part of the law may have on immigrants and their families, but applauded the Court’s decision to invalidate most of the law’s objectionable provisions. "The Court's decision to strike down the other provisions of the Arizona law reaffirms the strong role of the federal government in regulating immigration," said Archbishop Gomez. "The Church will continue to stand by immigrants and their families and seek justice on their behalf," he concluded. As Justice Anthony Kennedy wrote in the Court’s Majority Opinion: "The history of the United States is in part made of the stories, talents and lasting contributions of those who crossed oceans and deserts to come here." No sooner had I posted earlier today about some of the challenges that religious-run institutions that provide social, educational, medical or other similar services may face if they seek to continue providing such services in the future, than I was made aware of a rather relevant recent article by Princeton Biothethics professor Peter Singer, “The Use and Abuse of Religious Freedom,” http://www.project-syndicate.org/commentary/the-use-and-abuse-of-religious-freedom. Singer may well be (as Time magazine alleges) one of the world’s 100 most influential people. I honestly don't know. Being myself both pro-(human) life and hence profoundly suspicious of the whole direction of the animal rights movement, I have neither read nor followed Singer’s work in any detail. While certainly acquainted with the general orientation and direction of Singer’s ideology, I make no claim to have read or followed his work sufficiently to have the requisite familiarity to address his overall claims myself. Singer is certainly right in suggesting that governmental policies which pressure religious communities to withdraw from providing such social services would not destroy religious expression in America. But they would make the State the sole arbiter of what constitutes religion and simultaneously the sole arbiter of how cultural and social services may be provided in society. And that, as I wrote earlier, while significantly augmenting the State’s already abundant arsenal of power, would sadly leave our society that much poorer, that much more diminished. From the very beginning, when the apostolic Church operated a kind of urban commune, with the various social services that required, the Church has sponsored and supported an amazing variety of social institutions in the course of trying to carry out its multi-faceted mission on earth. Such institutions – hospitals, schools, etc. – serve simultaneously both religious and social purposes, functioning to further both the mission of the Church and the well-being of society. A sectarian school, for example, is obviously a school. As such, it has an educational aim, identifiable regardless of its institutionally religious character. On the other hand, an excellent education cannot exhaust its identity. However well Catholic schools may perform academically, the parochial school system in the United States certainly never was intended simply to duplicate the public school system, let alone attempt to outperform it in a solely secular sense. I myself am a grateful graduate of such schools. 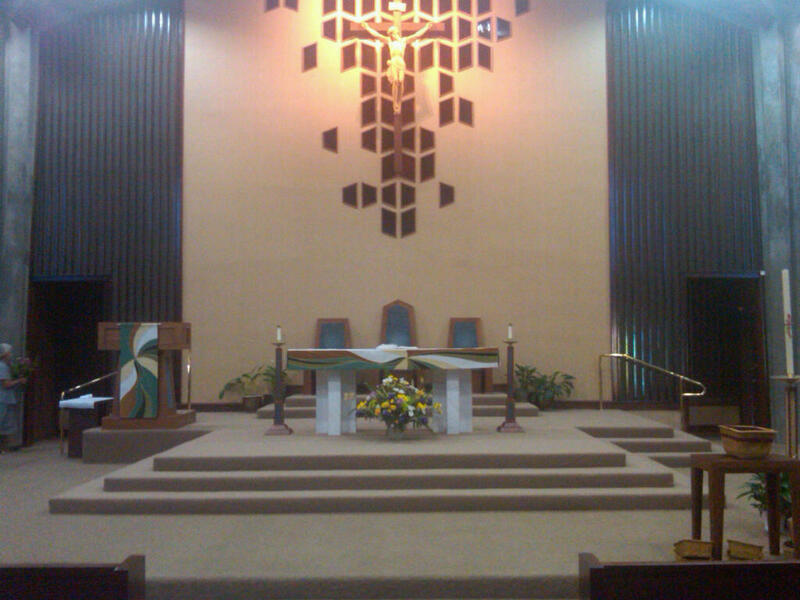 (I graduated from my parish elementary school 51 years ago today and from Catholic high school 47 years ago today). Whatever their limitations in comparison with public and private schools, much of what those schools did they did well. But, while valued for their academic performance and other activities, what made them different – and what has always been seen as their ultimate justification – was that they provided not only religious instruction but also a total religious environment, the effect of which on the hearts and minds of its graduates cannot completely be measured. A Catholic institution which loses that clear character and distinct mission might still do all sort of other things very well, but it will have ceased to serve its proper purpose. So, even while striving to be good schools, hospitals, or whatever, religious institutions must continually guard against the temptation simply to serve society’s secular goals – whether the better to fit in or to achieve adequate financial or social support. Educational, cultural, and social service institutions will always be goods in themselves and of value to the mission of the Church, but that mission is never identical to the mere maintenance and preservation of such institutions or limited to their educational, cultural, and social benefits. That is central, of course, to the current dispute about religious liberty. (I started to write “debate” about religious liberty, but a debate presumes parties actually listening and talking to one another, which is hardly the case any more in our country on any topic. So it seems more accurate to write “dispute” instead). Americans are accustomed to accommodating particular religious groups’ objections to being compelled to engage in certain activities that are contrary to their religious beliefs – Quakers not wanting to be drafted serve in the military, Jehovah’s Witnesses not wanting to have to salute the flag, Amish not wanting to be forced to attend High School, Orthodox Jews not wanting to be required to accept Saturday employment, etc. The Catholic objection to being compelled to pay for contraceptives and abortifacients fits into this familiar category and merits the same sort of accommodation. The Administration actually acknowledged the legitimacy of this claim in effect, by exempting churches from the HHS mandate. The problem, however, lies in the government’s imperious attempt to restrict the exemption only to a limited set of institutions based on its own narrow definition of what makes an institution really religious. But, surely, religious institutions, which also serve social, medical, or educational ends, cannot lose their religious character by simple governmental definition. That, surely, represents a restriction on religious liberty by any reasonable definition. You’d think the Administration would have learned its lesson when it tried to define who a “minister” is - and was soundly rebuffed by a unanimous Supreme Court last January in the Hosanna Tabor v. Equal Opportunity Commission case! Obviously, exempting Quakers from the Draft and all such similar cases do not directly infringe upon the “liberty” of other citizens. Contraceptives will remain widely available in the United States whether or not religious institutions are coerced into paying for them – but religious communities may feel compelled to quit running certain socially beneficial institutions. In Revelation 12, the Church appears as a woman in childbirth. Admittedly she is clothed with the sun, with the moon under her feet, and with a crown of 12 stars on her head; but all is not glory and immediate triumph. Alongside her, there appears the fearsome figure of a great red dragon who attempts to devour her child. The child is not devoured, of course, and the dragon’s efforts to do so ultimately fail. In the meantime, however, the woman is forced to fly off into he wilderness, where there is space for her to be nourished for a while. There are times to build and so become an effective player in the world. But there are also times when a greater degree of detachment may be forced upon religious communities. Such detachment would not result in the demise of religion. It may even strengthen it. But, if religious communities find themselves forced by State action to withdraw from providing wide-ranging medical, educational, and social services (as has already begin to happen in certain instances), the State’s power will certainly be augmented, while society will be that much poorer for it. Today, we celebrate a baby’s birth – a common enough event in ordinary human life, but something of a rarity in the Church’s calendar, which typically celebrates saints on the day of their death. Only three special people – Jesus himself, Mary his mother, and St. John the Baptist, whom the Gospel describes as filled with the Holy Spirit even from his mother’s womb – only those three get to have their actual birthdays acknowledged in the Church’s calendar. Today’s celebration transports us in spirit into an Old Testament atmosphere of pious, devout senior citizens in sterile marriages, whose youth is symbolically restored by the great gift of fertility. In the world of the Bible, few fats could be worse than not having any children. Quite unlike the myself and my generation only mentality so emblematic of our own time, fertility and the future it made possible were seen as the greatest of gifts, a great grace, a true blessing. This blessing was now belatedly being granted to Zechariah and Elizabeth, but it was not granted to them simply for their own satisfaction. Hence, the Gospel story recounts a whole series of special events surrounding, first, the conception, and, then, the birth, circumcision, and naming of their son. These circumstances served Zechariah and Elizabeth and their family and friends as visible signs, so to speak, of their son’s special status and mission, indicating the purpose of this miraculous event in God’s great plan for the whole human race. Zechariah and Elizabeth’s family and friends, when they heard that the Lord had shown his great mercy toward them, naturally rejoiced with them. At first, however, they still had their own pre-conceived understanding of what they were celebrating, as reflected in what they thought the newborn’s name should be. But they – and, through them, we – must be made to see that this miracle entailed much more than the Lord’s mercy to one couple, to one family, Hence, the physical miracle of John’s birth was augmented by even further signs dramatically highlighting his fuller significance. In the world of the Bible, naming someone was an act of authority. In the case of a newborn, it signified the father’s recognition of his child. But, as the angel had foretold to Zechariah, many would rejoice at this boy’s birth. He would belong not just to his parents but to the special mission God had made him for. Hence, his name would have to be special – a name chosen by God himself and announced by an angel. Because Zechariah and Elizabeth’s friends and family were people of faith, they recognized in this a sign that God really was still present and active in the world. So, unable to keep the good news to themselves, they immediately anticipated John’s own special mission by spreading the word throughout the hill country of Judea. Today’s feast focuses on the birth of John the Baptist. 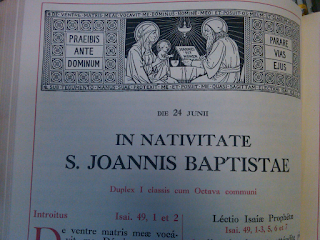 The familiar details of his preaching and baptizing we will hear about again, as we do every year, in Advent. That career was actually quite brief – cut short by his arrest and eventual execution. John’s martyrdom is recalled in the Church’s calendar in August, but it seems appropriate today, during this current two-week “Fortnight for Freedom,” to recall both the fact and the circumstances of John’s imprisonment and execution by King Herod Antipas. Luke’s Gospel suggests that King Herod himself had actually admired John. It says Herod liked to listen to him, but also that he was very much perplexed (Mark 6:20). The source of Herod’s perplexity seems to have been the challenging part of John’s preaching, - for John had defiantly challenged Herod regarding the king’s marriage to his brother’s wife – which violated Jewish religious law regarding marriage (Mark 6:18). Just as John had pointed ahead to Jesus in life, his death also pointed ahead to Jesus’ own death at the hands of Roman political authority – and beyond that to the many martyrs whose heroic witness to their faith and to the moral law would put them at odds with political power. Indeed, the liturgical calendar this week commemorates several important early martyrs: on June 30. the First Martyrs of Rome, executed in A.D. 64, in the persecution begun by the Emperor Nero; on June 28, St. Irenaeus, an outstanding bishop and theologian, martyred around the year 202; and on June 29, the great Apostles Peter and Paul. John’s birth, which we celebrate with such solemnity today, continued the process that began with the promise God long ago made to Abraham, then renewed over and over to his descendants, and finally fulfilled in Jesus, whose own birth we will celebrate just six months from now. Jesus’ birth is celebrated in the week of the winter solstice, when the days are short, and the nights long and dark, when the ancient world celebrated the birth of the sun and the imminent prospect of increased light and longer days. But the birth of John is celebrated in the week of the summer solstice, when the days are long and the sun is bright, but after which the days will quickly start to get shorter. Today heralds the hope that the dry desert summer will soon yield to the autumn rains and the life-giving wetness of winter – nature’s way, perhaps, of symbolizing the effect in every spiritually dry and sterile soul of the coming of Christ whose mission it was first John’s – and is now ours – to announce to the world. The day of a saint's death is when we usually celebrate his or her memory, but the Church’s liturgical calendar also commemorates three actual earthly birthdays – those of Jesus himself (Christmas, December 25), the Blessed Virgin Mary (September 8), and this weekend’s solemnity of the Nativity of Saint John the Baptist. 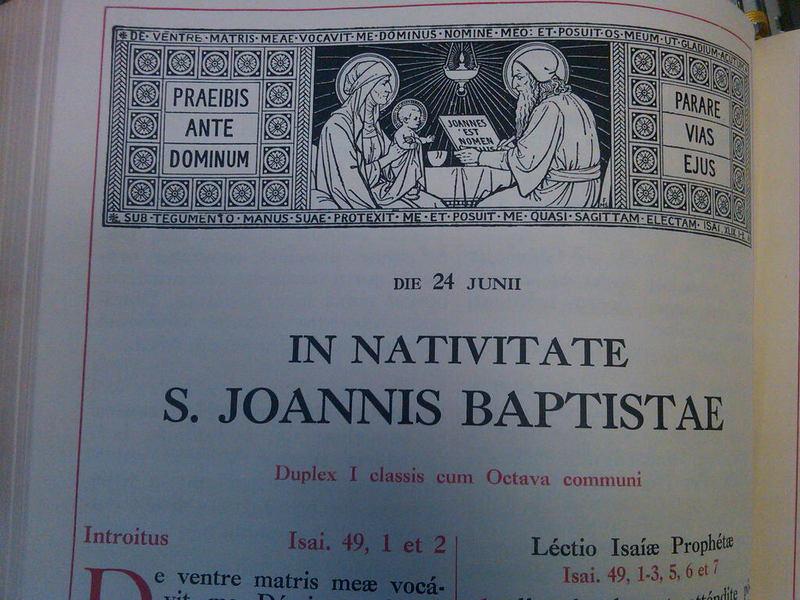 One of the oldest festivals of the Christian calendar, the Nativity of John the Baptist on June 24 comes (according to the ancient Roman method of computing dates) exactly three months after the celebration of the Annunciation on March 25 and six months before Christmas thus following the sequence of the Gospel narrative. At the Annunciation, the Archangel Gabriel informed the Virgin Mary that her relative Elizabeth was miraculously already six months pregnant (Luke 1:36). Mary then journeyed to visit Elizabeth - the event known as the Visitation and celebrated in the calendar on May 31. At the Visitation, according to Luke’s Gospel, baby John “leapt” in Elizabeth’s womb at the sound of Mary’s greeting (Luke 1:44), thus already beginning his prophetic mission of preparing the way for the coming of Christ. Just as the celebration of Christmas corresponds to the winter solstice, after which the days begin to get longer again, the celebration of the birth of John the Baptist corresponds to the summer solstice, after which the days soon begin to get noticeably shorter. Many of the traditional “Midsummer Eve” customs in European folklore (bonfires, etc.) concerning this date derive from the connection between the feast and the solstice. In Church tradition, the fact of this feast falling around the time of the solstice also came to be seen as symbolic, in the context of John the Baptist words with regard to Jesus: He must increase, but I must decrease (John 3:30). The special Preface used in the Mass highlights the entire mission of John the Baptist, concluding with his “supreme witness by the shedding of his blood.” This refers to the martyrdom of John the Baptist at the hands of King Herod Antipas (Mark 6:17-29). Although today’s feast focuses on John the Baptist’s birth, and his martyrdom is recalled on its own separate day (August 29), it seems very appropriate at this time to recall both the fact of John’s death and the circumstances surrounding it. According to the New Testament account in Mark’s Gospel (Mark 6:17-29), it appears Herod had actually admired John. Mark’s Gospel says Herod liked to listen to him, but also that he was very much perplexed (Mark 6:20). The source of Herod’s perplexity seems to have been the challenging part of John’s preaching, for John had challenged Herod regarding his marriage to his brother’s wife in defiance of Jewish religious law regarding marriage (Mark 6:18). Just as John pointed ahead to Jesus in life, his death also pointed ahead to Jesus’ own death at the hands of Roman political authority – and beyond that to the many martyrs whose heroic witness to their faith and to the moral law would put them at odds with over-reaching political power. Homily at the 1st Fortnight for Freedom Holy Hour, Immaculate Conception Church, Knoxville, TN, June 21, 2012. As we all know (otherwise we wouldn’t be here this evening), the Bishops of the United States are encouraging us, especially in these two weeks between now and July 4, to devote some special attention what it means to be faithful to the Gospel in today’s world, what are the challenges the world continually presents us, and how important the freedom of the Church is in our being faithful in the face of all such challenges. Appropriately, we are gathered here on this eve of the day in the Church’s calendar, which commemorates two of the English-speaking world’s most famous martyrs, St. John Fisher and St. Thomas More. St. John Fisher lived from 1469 to 1535. A Cambridge University scholar, Fisher became Bishop of Rochester, at that time the poorest diocese in England. He remained in that post for 31 years and apparently made every effort to become a model bishop. St. Thomas More lived from 1478 to 1535. The more famous of the two, More was a married layman, a scholar, famous throughout Europe as the author of Utopia, and a practicing lawyer who served for a time as Lord Chancellor of England under King Henry VIII. Because of their prominence, both Fisher and More were required to swear an oath in support of the English Parliament’s Act of Supremacy, which rejected the Pope’s universal jurisdiction over the Church and recognized the King instead as Head of the Church in England. For their fidelity to the true faith, both met with a martyr’s death – Fisher on June 22; More on July 6, 1535. It is hard to tell the sad story of Henry VIII and the English Reformation without highlighting St. Thomas More. When we hear about St. Thomas More today, many – maybe most – of us imagine him as portrayed, for example, in the 1969 film Anne of a Thousand Days or the much more recent Showtime TV series The Tudors, or most famously of all perhaps in Robert Bolt’s 1960s play and movie A Man for All Seasons. One of that play’s particular merits, I believe, is how it highlights More’s evident lack of any desire to be a martyr. There was nothing fanatical or obsessive or self-promotional about More’s opposition to the King’s policy. He did not desire to be the King’s opponent and did everything he could to avoid it. A sharp lawyer, he was willing to use whatever legal means were available to him to stay out of trouble. Some of us may remember More’s lecture to William Roper about the value of the law in A Man for All Seasons: And when the last law was down, and the Devil turned round on you – where would you hide, Roper, the laws all being flat?... Yes, I’d give the Devil the benefit of law, for my own safety’s sake. Even in the early Church, when the danger of martyrdom was a common concern, the Church never encouraged any kind of self-promoting, fanatical desire for martyrdom. Jesus warned his disciples to expect and be ready for challenge and even martyrdom. But that does not mean going out of one’s way to seek or create conflict, to be looking for a fight. On the contrary, we are taught to value our human, earthly, civil community, and to contribute to its welfare as far as possible. One of the great merits of our constitutionally guaranteed freedom of religion has been how it has benefited both Church and State, both religion and civil society. 16th-century England lacked the guarantees that would later be written into our Constitution by the Bill of Rights. Even so, the Freedom of the Church was in principle recognized in the English legal system to which St. Thomas More was so devoted. Three centuries earlier, in the famous Magna Carta, King John had been forced to acknowledge the Freedom of the Church: We have granted to God, and by this our present Charter have confirmed, for Us and our Heirs for ever, that the Church of England shall be free, and shall have all her whole Rights and Liberties inviolable. In the end, of course, such legal guarantees proved insufficient, when faced with a determined government. In the end, therefore, for all his loyalty to the King and his love for the law, Thomas More absolutely refused to compromise on the issue of the Church’s freedom. And that – the Church’s freedom – was the fundamental issue. On other matters, More the statesman, More the politician who is now the patron saint of statesmen, was willing to compromise. More was willing, for example, to recognize Parliament’s right to alter the succession to the throne in favor of the new heirs that it was widely hoped would issue from the King’s “marriage” to Anne Boleyn. Thomas More most certainly did not approve of the King annulling his marriage to Queen Catherine so that he could marry someone younger and (hopefully) more fertile. But, while the King may not have had any real right to annul his marriage, More also knew how to make distinctions – as we all must. More recognized that the law of succession was part of what belonged to Caesar, and he recognized and respected Caesar’s jurisdiction. The freedom of the Church, however, was another matter - not what belongs to Caesar but what belongs to God. King Henry VIII was neither the first - nor would he be the last - civil power to try to redefine the role of the Church in society. The many martyrs of the 20th century certainly attest to that. (There were more martyrs in the 20th century than in any previous one). The challenges the Church faces today are not identical to those it confronted in 16th-century England, of course; and it would dishonor the fortitude of the martyrs, both ancient and modern, to pretend otherwise. But, whatever form they may take in different times and situations, challenges to the freedom of the Church will always arise. And such challenges must always be answered - as faithfully as St. John Fisher and St. Thomas More and so many others answered the challenges they faced in their time. One week from today, June 28, 2012, will be the 300th anniversary of the birth of one of the 18th century’s most famous and complex figures, Geneva-born Jean-Jacques Rousseau (1712-1778). A unique and genuinely radical thinker, who bridged 18th-century Rationalism and 19th-century Romanticism, Rousseau was the author (most famously for students of political theory) of A Discourse on the Origin of Inequality (1754) and The Social Contract (1762), but also of an idiosyncratic treatise on education Emile (1762), his autobiographical Confessions (1769, published posthumously in 1782), and Reveries of a Solitary Walker (written at the end of his life and also published posthumously in 1782). Although in time I took quite a liking to Rousseau’s Confessions and enjoyed reading Reveries of a Solitary Walker (both books that I still own, among the few remaining remnants of my youthful academic aspirations), it was, of course, Rousseau the political philosopher whom I first encountered and first seriously engaged with. Rightly or wrongly, Rousseau was often teamed up with Thomas Hobbes and John Locke, the 17th-century English social contract theorists, to constitute a sort of trinity of early modern political theory. A more expansive syllabus might continue with Edmund Burke and 19th-century Restoration-era reactionary theorists, and romantic radicals; but for the most part “modern” political theory meant the social contract tradition of Hobbes and Locke with at least a nod to Rousseau. Whereas Locke leads to Liberalism, Rousseau led elsewhere. Thus, when we studied “Radical Political Thought,” we began with Rousseau. Indeed, Rousseau’s richness may rest in precisely how he highlights the strengths and weaknesses of both those directions in modern thought. In The Communist Manifesto, Karl Marx wondered “what earlier century had even a presentiment that such productive forces slumbered in the lap of social labor?” Indeed! A little less than a century earlier, in The Social Contract, Rousseau had taken it for granted that different climates would determine different forms of government. Prior to the advent of modern capitalism and its incredibly immense increase in productive capacity and output, Rousseau’s assumption of inherent - and ineradicable - limitations on human freedom and artifice must have seemed more like self-evident common sense. Unable to anticipate (and evaluate) capitalist modernity’s material accomplishments, Rousseau still thought he had seen enough of what “progress” had to offer, however. His most extreme such statement (perhaps also his most famous one) was his rejection of Aristotle’s view (Politics I, ii) that the first one to have constructed a city was humanity’s greatest benefactor. Of course, considering the biblical view that it was the murderer Cain who first founded a city (Genesis 4:17) Rousseau’s de-mystification of the virtues of civilization in his Discourse on the Origin of Inequality actually tapped into other deeply rooted understandings – understandings which modernity (especially liberal modernity) has usually tried to repress, and which radical theorists of all sorts have struggled to recover. That Rousseau remains equally famous for an alternative, totalitarian utopia (The Social Contract) – in effect, a de-Christianized, re-paganized neo-Geneva, modeled on republican Rome – just confirms the complexity and depth of his radicalism, the recognition of the insolubly problematic character of human nature, once imagined as abandoned to itself without a supernatural end and destiny. Fittingly, this “Fortnight for Freedom” will begin on the eve of the Church’s annual commemoration of two famous 16th-century English martyrs for the freedom of the Church - St. John Fischer (1469-1535) and St. Thomas More (1478-1535). Both were martyred by order of King Hencry VIII in 1535 (on June 22 and July 6, respectively) for their refusal to accept the English Parliament’s Act of Supremacy, which had repudiated the Pope’s universal jurisdiction over the Church and declared the King the new Head of the Church in England. Also included within this two-week period are the Church’s annual celebrations that honor important early martyrs who witnessed to their faith in the face of persecution by reigning political power – St. John the Baptist (June 24), St. Irenaeus (June 28), SS. Peter and Paul (June 29), and the First Martyrs of the Church of Rome (June 30). This “Fortnight for Freedom” will conclude on Independence Day. Nowadays, July 4 may be mainly a day for picnics and fireworks, but it remains an especially appropriate occasion for us to recall, celebrate, and emphasize, both as Catholics and as Americans, our distinctive national history and our constitutional heritage of religious liberty. While world-wide elite opinion breathes a sigh of relief at the euro-affirming results of this past weekend’s parliamentary election in Greece, yet another difficult summit meeting is underway now in Mexico. Meanwhile the mess European elites have created continues, while on this side of the Atlantic we contemplate with increasing unease how Europe’s economic deterioration may further undermine our own economic recovery and irrationally impact our presidential campaign. Indeed, the ironic premise of the opposition campaign seems to be that, while the challenger and his party maintain that government really is not the engine for fixing the economy and would best get out the market’s way, the contradictory claim is constantly made that the incumbent President is to blame for failing to fix the economy and that, if elected, new President would somehow be able to do so! My guess is that there are certainly some things government could do, but very little government can do right now given the ideological partisan divide and consequent gridlock. After all, everyone remembers how hard it was for President Bush to get Congress to cooperate when the economy was clearly careening off a cliff back in 2008! And, if anything, I think the divide is even deeper now. And I doubt there is too much any President can do on his own to fix Europe’s self-inflicted euro-mess! Before the name had achieved quasi-mythological significance, The Watergate was just another Washington, DC, hotel. In 1972, the Democratic National Committee had its headquarters there. And there, 40 years ago yesterday, five men were arrested for breaking and entering. The great political scandal that ensued from that burglary riveted an entire country in the mid-1970s and resulted in the first (and so far only) resignation of an incumbent President and also (as if to maximize the anomaly even further) the first presidential succession by an appointed Vice President (our first – and so far our only - appointed Vice President). As a graduate student during the summer of 1973, studying that summer for my upcoming General examinations, I (like almost everyone else I knew) followed, almost transfixed, the daily TV coverage of the Senate Watergate Hearings. The Senate Select Committee on Watergate featured such luminaries as Senators Sam Ervin and (Tennessee’s own) Howard Baker, while the hearings themselves highlighted a seemingly made-for-TV cast of starring villains. (Of course, that was still all back in the old days of common, shared news experience, when we all watched more or less the same story on TV, rather than hiding from one another as we now do in our separate, ideologically defined cable niches). While on balance beneficial for the Republic, the ouster of a popularly elected President in the middle of his second term did set an unfortunate – or, at any rate, ambiguous – precedent. That precedent helped make possible the legally frivolous, purely partisan-motivated impeachment of President Clinton a mere decade and a half later. (As Karl Marx famously remarked, in his Eighteenth Brumaire of Louis Napoleon, history does indeed repeat itself – the first time as tragedy, the second time as farce). Another unfortunate legacy of Watergate has been the rise of “celebrity journalism.” Whereas with Watergate it was the politicians themselves (and their henchmen) who degraded our public life, it is now journalists and journalistic “pundits” who have collaborated in replacing rational, democratic, political debate with a political culture obsessed with scandal and mutual recrimination. The routine application of the suffix “-gate” to almost every real or contrived scandal reflects this ridiculous outcome. On the other hand, the fallout from Watergate did result in some positive attempts to limit spending in presidential campaigns. The measures taken were imperfect at best, and any limits on citizens’ freedom to spend money on political campaigns will always labor under the suspicion of questionable constitutionality. Even so, a system was put in place, which for some three decades was accepted by both parties - until torpedoed by Barack Obama in 2008. If imperfect campaign finance reforms (and their often unintended consequences) were an inevitable result of the Watergate scandal, it was also inevitable that sooner or later a candidate would come along who could on his own raise so much more money than his opponent that he would opt out of the federally funded system – exactly what Obama did in 2008. Add to that the imperious involvement of the Supreme Court, and elections are now even more all about money. Thus, the outspent candidate in 2008 and long-time supporter of campaign finance reform, John McCain recently labeled the Supreme Court’s 2010 Citizens United decision “the most misguided, naive, uninformed, egregious decision of the United States Supreme Court I think in the 21st century.” One result is that in 2012 such vast sums of money are being wasted on political campaigns as to make the election experience almost unrecognizable, were some Rip Van Winkle to awaken from that so much more innocent, Watergate-era world. A couple of years ago, shortly after I became a pastor in Knoxville, Tennesssee, some friends from New York came to visit. They opened the back door of the house and were thrilled to discover a back porch and a backyard. But I had to admit to them that I had never yet ever even stepped out onto that back porch or in that backyard! Jesus did much of his public preaching and teaching in rural Galilee. So it’s no surprise so many of his images and parables are agricultural in inspiration. That may make obvious sense, but it also may make them hard for those of us whose background is completely urban to relate to. Indeed, to a non-gardener like myself, gardening seems incredibly complex and difficult. To a non-farmer like me, farming also seems complex and difficult. And, of course, real farming is hard work. But Jesus’ two parables which we just heard [Mark 4:26-32] focus on something else – less on the human work involved and more on the mysterious and silent part of the process. The kingdom of God, Jesus says in the first parable, is as if someone scatters seed on the land and over time watches it sprout and grow and yield fruit for the harvest. If the first parable focuses on the mysterious, silent, and patient process by which the seed once originally sown sprouts and grows on its own, the second parable contrasts the full fruition of God’s kingdom with its seemingly modest and maybe even inauspicious beginnings. Obviously, a lot of what we do in life involves effort, even strenuous effort at times. Yet we all know that sometimes there is only just so much, which work and effort can accomplish. However ambitious and elaborate our plans, sometimes all we can actually do is to plant some seed, so to speak, and then wait patiently to see what happens. If that is true enough in ordinary life and in our ordinary activities, how much more true is it in the mission of the Church? Much of what we do in ministry is like that, sowing seeds, so to speak, sometimes in lots of different ways with no obvious or immediate result, and then waiting – patiently and hopefully – for something to happen. Even in the first parable about the seed growing of its own accord, the farmer does do his part. There is activity on the farmer’s part, just as there is activity on the Church’s part - on our part - in the coming of God’s kingdom. The farmer makes his contribution, as God expects all of us to do. But, in both cases, the crucial action is God’s action – action, which occurs mysteriously and may mainly seem hidden. Our culture encourages us to be busy all the time and to be efficient, accomplishing a lot in our busy work. But, just as the famer in the parable scatters seed on faith, with no certain knowledge of how it will grow, the Church has to sow the seed of God’s word in the world, not knowing how or when our efforts will find fulfillment but confident about the coming of God’s kingdom in our lives and in our world – the blessed hope and the coming of our Savior, Jesus Christ, that we say we're praying for in every Mass. Credit the potentially very close election and the need to maximize Latino turnout, whatever the immediate motivation, it was heartening to hear the President announce yesterday that the Administration will effectively employ its prosecutorial discretion to protect from deportation many of the Undocumented, who would have been the intended beneficiaries of the so-called “Dream Act” (were such legislation actually possible in the currently paralyzed political climate). This well chosen action on the President’s part will be neither the eschatological fulfillment liberal supporters of the “Dream Act” desire, nor the cataclysmic apocalypse right wingers fear. It does, however, help a significant number of people – youth and young adults who (in Archbishop Gomez’s words) “are bright, energetic, and eager to pursue their education.” It also represents a worthy first-step toward breaking the legal logjam immigration issues – as well as an effective illustration of the merits of a strong Executive branch under our Constitution. Of course, it takes more than a piece of paper to guarantee freedom - for anyone. The freedom of the Church had been at issue in the great conflict between King John’s much more accomplished father, King Henry II (1133-1189, King 1145-1189) and his Archbishop of Canterbury, Thomas Becket (1118-1170), martyred by four of the King's thuggish henchmen (otherwise known as knights of the realm) on December 29, 1170 - and subsequently (and very rapidly) canonized in 1173. Magna Carta or no, it would continue to be an issue all over Europe throughout the Middle Ages. Then, with the Renaissance and Reformation, the situation would only get that much worse for the Church and for its freedom. In England, Magna Carta or no, the Church’s freedom would be eradicated completely by Henry VIII and his successors Edward and Elizabeth, resulting in many more martyrs, the most famous of whom were St. Thomas Fisher (1469-1535) and St. Thomas More, (1478-1535), both honored together on the Church’s calendar later this month. Almost six centuries after King’s John’s signature had been rather reluctantly affixed to the Magna Carta, the First Amendment enshrined the freedom of the Church in the U.S. Constitution. The American situation and perspective were radically different from medieval England’s, of course. In the medieval case, the Church was one and universal, the State’s equal at least, a real rival superior at times in power. In the American case, the Church was divided into different denominations and sects (some of which enjoyed the privileges of establishment in specific states – the 1st Amendment applying originally only to the Federal Government). It was religious pluralism, which provided the occasion for the American experiment. In the Church’s self-understanding, the Church is a supernatural society, whose nature and purpose transcend that of the State (or any other social institution). In the American pluralist model, in contrast, churches are among the many and various voluntary social institutions which are at the heart of society, and whose autonomy the State is constrained to respect. Historically, that autonomy has worked to the benefit of the Church, which has thrived and flourished in the free air of American religious liberty. And it has worked well for society as well, which has benefited from the freedom of its citizens to build communities and create a network of familial, educational, and medical institutions (among others), which together have built an authentic American civil society. An activist, purposive government, which acknowledges its natural limits (and its inherent lack of transcendent purpose) will only benefit by recognizing the legitimate space for civil society and its component institutions, the Church first among them. Even as our political system is radically redistributing wealth from the young to the old, our popular culture remains radically youth-oriented. Our society’s obsession with youth and beauty together with the fact that young people probably spend more money on movies may make our current epidemic of silly action movies and the like almost inevitable. It is all that much more refreshing, therefore, to experience a film featuring predominantly older actors portraying a period in life and its challenges that most senior citizens can well relate to. That movie, of course, is the recently released film The Best Exotic Marigold Hotel (based on Deborah Moggach’s 2004 novel These Foolish Things). The ensemble cast includes such stars as Judi Dench, Maggie Smith, and Tom Wilkinson, among others, part of an oddly assorted group of British seniors, several in economically challenged circumstances, who have (somewhat improbably) settled in a retirement hotel in Jaipur, India. Operated by a young and dynamic, but impractical entrepreneur, the dilapidated old hotel is a vivid metaphor for the circumstances in which these expatriates find themselves. The film follows the predictable plot-line of strangers getting to know each other as they struggle to adapt to alien (and somewhat difficult) surroundings, rediscovering strengths in themselves and new motivation to carry on (complete with predictable romantic entanglements). In the process, one will die happy (having reconnected with a native Indian lover from 40 years back), one will leave her husband and return home, and the others will all remain in India, their renewed lives reflected in the renewed condition of the hotel. The predictability of the plot in no way detracts from the beauty of the story. The movie visually assaults the viewer (and, a fortiori, the characters) with the bright light and color and chaos of India – effectively symbolizing the experiential assault on the defeated, beaten down people they had become and opening a brighter path, made possible precisely by the chaos of their situation. The movie imparts a new meaning to the hackneyed expression one’s “golden” years! The full title of the hotel is The Best Exotic Marigold Hotel for the Elderly and Beautiful. Assuming what that title says grammatically is what was really intended (the Elderly and Beautiful – not the Elderly and the Beautiful), the film invites its aging characters (and through them their audience to engage in the counter-cultural thought experiment that being beautiful is not an alternative to being elderly but can coexist with it. "A Trinity of One Substance"